Extraordinary detached holiday home with lovely terrace. 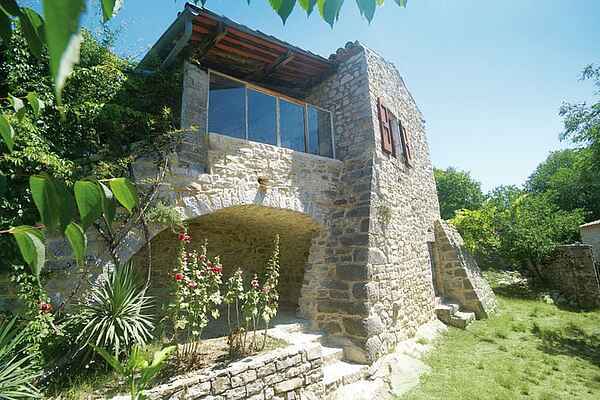 It's situated in a small village, 3 km from Beaulieu. Behind the house the rocky oak forest starts, where you can take the most beautiful walks past nature's art: the lime rocks. The forest is like a sister to the famous and well-visited Bois de Païolive (8 km), but then quieter. Also visit the impressive dripstone caves Aven d'Orgnac (25 km). Near La Bégude (27 km) you'll find the ruins of the 11th century Château d'Allègre. You can relax in the recreation park near Le Rouret (5 km), and for water fun you can go to Mazet-Plage (6 km) where you'll find a swimming lake with beach. For a recreational lake with facilities for water sports you can visit the Lac de Villefort (39 km). The tourist Vallont-Pont-d'Arc is 20 km away with, last but not least, the famous Gorges de l'Ardèche with its beautiful views. Bakery, grocer and restaurant in Beaulieu. Supermarket and terraces in Les Vans (15 km). Beautiful stone holiday home. Built against a hill and therefore hard to photograph, but its location is splendid. You have access to a furnished patio where the children can play to their heart's content. Via stone steps you enter the enormous, partly covered terrace with garden furniture, stone barbecue, and six lounging chairs. A great place to be! From here you have access to the house, that consists of two buildings. The interior is new and very well-kept. Building 1 (to the right of the terrace): Cosy living room with comfortable seating area, fireplace, TV, DVD, stereo (radio/cd) and dining area. Open kitchen with dishwasher, microwave, and fridge/freezer, separated by a bar. Bathroom with shower and toilet. Building 2 (to the left of the terrace): Bedroom 1: a double bed and bunk bed. (Second) bedroom with shower. Seperate (second) toilet. Upstairs: Bedrooms 2 and 3; both with large double bed. (1.60 x 2 m). Washing machine.